…But yeah, I am. Guns are a huge f**king problem. Two officers are in stable condition, with one in surgery, and the suspect is dead following a shooting Saturday at a Walmart in suburban Phoenix, authorities said. A one-year-old child, who was unharmed, was also found in the home and turned over to child protective services, but police did not confirm whether the child was Bell’s…. Lauren Hawes told The Associated Press Saturday that she and her 1-year-old daughter hid in a neighbor’s house while her father, Wayne Anthony Hawes, went on a shooting rampage that killed five people, including her grandmother and cousin. These are just four reports of four wretched events — crimes — over the last couple of days, all gleaned from a single news site (Talking Points Memo). As such, they’re just the gun miseries from Friday and today that rose to some kind of web prominence. There are, certainly, many, many more lurking below that threshold of media attention. All of these crimes, all of this woe, were done in their own contexts, their own sequence of events. The guns didn’t decide to shoot themselves — I get that. But the litany, the daily butcher’s bill, tells another story, alongside the too-common and too-comfortable one of “people kill people.” People kill a lot fewer people when it’s harder to do. Firearms make it easy. 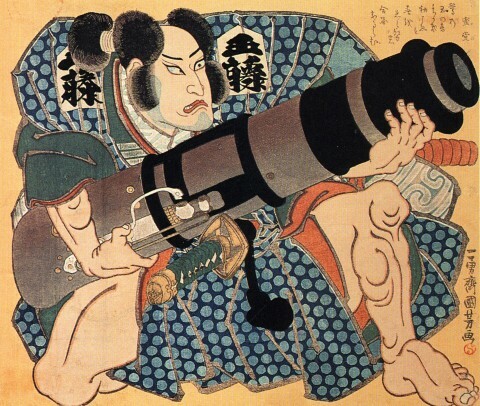 Image: Utagawa Kuniyoshi, The Actor, before 1861. This entry was posted on April 23, 2016 at 3:26 pm and is filed under Guns, Uncategorized. You can subscribe via RSS 2.0 feed to this post's comments.